Enjoy some lighthearted fun on a holiday! Google calendar adds public events but does not get social! Google calendar is one the few recent Google products that I love and use on a regular basis. It gets so many things right for an online calendar right – it lets you coordinate with colleagues, schedule events, check your calendar, anytime anywhere. The interface is efficient, letting one add and edit events easily. I have thought many times how Google calendar could weave a social events system like Upcoming system around it. After all, they have the basic ingredient for a great social system – a strong personal motivation for people to contribute. I tell Google calendar about my events since it helps me keep my life organized. It already knows about many of the events I am planning to go to. It knows about the people I invite to those events or who invite me to theirs. The social hooks already exist. It would be so easy to create a larger social arena around the information in my calendar that I am willing to make public. 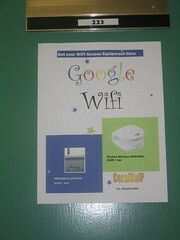 to be in same office building)Its hard to be in Mountain View and not to constantly feel the presence of Google. Everytime I go out to dinner, we can count at least 3-4 people wearing Google shirts. Google does usability testing at my favorite cafe (Dana Street Roasting House). Many of my friends work for Google. And now, everytime I look at avalable wireless networks, I see “GoogleWifi”. I have not actually used it myself – its not because I did not try. I tried – from several places in Mountain View. Even reached the wifi registration page a few times. But the connection is not strong enough. Not even from the coffee shop (Dana Stree cafe). Also, I have been using Live555 (a free wireless provider) for a while at Dana Street, so feel a certain loyalty towards them. Terry Winograd runs an excellent seminar focused on HCI (at Stanford). I just saw from the mailing list announcement that this Friday (March 10th), the speaker is from Google. Dan Russell who used to be at IBM, is now a research scientist focused on the area of “search quality and user experience” at Google. He will talk about divining searcher intention. In recent months, Yahoo has made a series of high profile hirings of HCI researchers (Marc Davis comes to mind). I had not realized Google was making similar hirings. (I might be wrong here – please correct me if I am).